The fan park, which will be open for two days, on 14 and 15 October, will also allow people to take in the game through a VR experience from the perspective of a fan attending a Premier League match. This will feature aspects such as the sound of fans cheering in the stadium when the players run out onto the pitch. Other activities will include the chance for attendees to create their own Topps playing card. Visitors to the event will be given an RFID card or wristband, which they can use to tag in and out of various activities that will measure things such as how fast they can run and their height. This data can then be included on the card. In addition, there will be a double-decker bus, similar to the one used by the players of the Premier League-winning team for their victory parade, which people will be able to board and have their picture taken on. There will also be a presence from some of the Premier League's teams, which will have their own areas, with mascots and information on the history of the club. Former Premier League stars Alan Shearer, Paul Dickov, Shay Given and John Barnes will also be in attendance. The day will conclude with fans being able to watch several games on big screens. 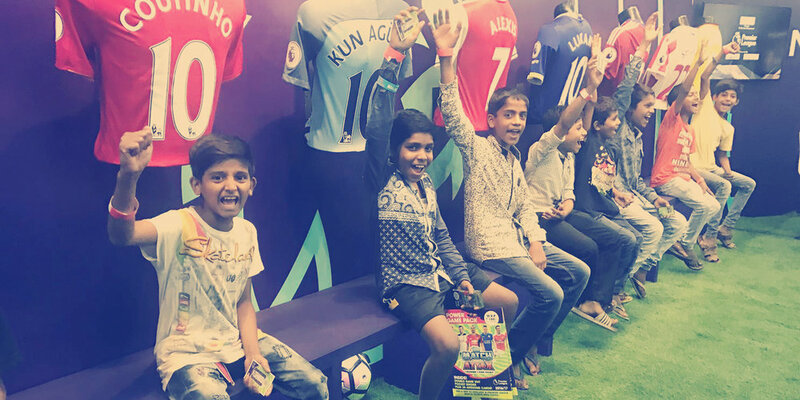 Momentum Worldwide, which is creating the experience in Bengaluru, was behind a similar event in Mumbai earlier in the year. Mike Kettles, executive creative director at Momentum Worldwide, said: "We are creating a range of experiences that will keep fans engaged from lunchtime until the end [of the day]. "We are trying to make sure there is information and entertainment wherever you look, even when fans may be queuing for an experience."